Tesla on Thursday took the covers off its long-awaited electric semi-trailer truck. 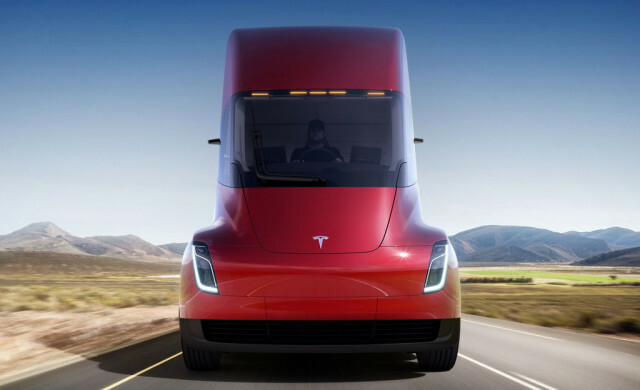 Dubbed simply the Tesla Semi, the truck promises both the longest range for an electric hauler as well as the best safety credentials of any truck its class, in this case Class 8 Heavy Duty. The Tesla Semi also has a center driving position, giving it something in common with the McLaren F1 supercar. Speaking of supercars, the Semi is said to feature a super-slippery coefficient of drag of just 0.36 Cd, which is comparable with many supercar models. This is made possible by the streamlined shape which you’ll notice is devoid of side mirrors. Instead, the truck relies on rear-facing cameras that project images onto two display screens, one either side of the driver’s seat. There’s impressive performance, too, as far as trucks are concerned. Tesla quotes a 0-60 mph time of 20 seconds, and that’s with a gross weight of 80,000 pounds. The performance is made possible by four powerful electric motors mounted at the rear axles. Tesla hasn’t gone into detail regarding the batteries. The company says two ranges will be offered: 300 or 500 miles. That’s impressive considering rivals such as Daimler have only shown trucks with around 200 miles of range so far. And the energy consumption of the truck is expected to be less than 2 kilowatt-hours per mile, which should result in energy costs half that of conventional diesel trucks. During the presentation in Hawthorne, California, Tesla CEO Elon Musk said around 400 miles of range can be added in 30 minutes. What isn’t clear, though, is how well the batteries will cope with high mileage and frequent charging. Tesla is also coy about pricing. Inside the truck, Tesla says there’s enough headroom for the driver to stand. The driver also has at his or disposal advanced self-driving features, although what capability there will be hasn’t been revealed. In terms of safety, the Semi has been designed with a reinforced battery that helps prevent damage upon impact and also gives the vehicle a very low center of gravity. In addition, the windshield is made of impact resistant glass, and jackknifing is prevented due to onboard sensors that detect instability and react with positive or negative torque to each wheel while independently actuating all brakes. Tesla hopes to have the Semi in production as early as 2019 although that date could be pushed back given all of the headaches Tesla is experiencing with Model 3 production. And the Semi won’t be the only electric truck on sale at that point. Daimler has already shown a number of electric trucks from its various brands. And then there’s General Motors, Cummins and American startup Nikola, all of which have revealed electric truck plans of their own. Beyond the truck, Tesla also has in the hopper the Model Y crossover SUV, a next-generation Roadster, and a pickup truck. That’s on top of its plans for energy storage and solar roofs. In other words, it’s going to be busy times at the Californian firm for years to come.